Vimes Consulting assists British firms with an interest in trade, exports and other opportunities in Ukraine. With five years’ experience and presence in both countries, Vimes offers hands-on, actionable solutions helping UK companies make the most of the opportunities whilst minimising costs and risks. Ukraine is one of the largest European markets, both geographically and population-wise, yet it is often overlooked by British companies. With a population of 42 million, central European location and the Free Trade Agreement with the EU, the country offers a considerable market for UK exporters. Diverse industrial base, highly educated and skilled workforce and geographic proximity offer attractive sourcing opportunities, especially in the B2B segment. Challenges include an unsteady economy, red tape and weak government institutions. All of these are not uncommon in the emerging markets and can be overcome with careful planning and due diligence. Ukraine and UK have a robust trade in goods and services. In 2016 UK’s exports* made up 2% of the overall inflow of goods into Ukraine. With 10.5% Britain is also a very significant supplier of services to Ukraine, second only to the US. When it comes to the UK’s physical exports into Ukraine these include petroleum products (25%), vehicles (17%), products of heavy industry and mechanical engineering (11%), pharmaceutical (9%) and chemical products (6%). Ukraine’s exports to UK breakdown is: Sunflower oil (17%), Metals (35%), Wood Products and Furniture (8%), Cereals 8%, Heavy Machinery (3%) and Apparel (2.5%). Next to the heavy hitters like sunflower oils and metals, we have seen healthy foods (birch tree juice, berries, snacks), high-end furniture, and food packaging amongst Ukrainian exports achieving success in the UK. Ukraine has also been showing its potential as a services provider, particularly in the space of IT outsourcing, with many British firms of all sizes choosing Ukraine for their information technology development requirements. An interesting case study of British engineering export success to Ukraine is Gloucestershire’s Dowty Propellers and Ukraine’s aircraft manufacturer Antonov. Following a contract from Saudi Arabia Antonov was required to manufacture a multipurpose transport aircraft AN 132 in record time of under two years. The success of the project depended on suppliers and partners who could offer the necessary product, flexibility, and expediency. Dowty Propellers stepped in to supply its R408 propeller systems on the aircraft, the rigging of strain gauges for its ground and flight testing, assistance during demonstration flights, along with training for Antonov personnel to provide full operational knowledge of the systems. “We’ve established an excellent working relationship with Antonov since signing the R408 propeller system’s supply agreement in January, and our teams are fully committed to making the AN-132D demonstrator a success,” said Oliver Towers, the President of Dowty Propellers. AN 132 was a success at the Summer 2017 Le Burget Air show where the role of Dowty Propellers was highlighted as being a key to successful completion of the project. As it’s often the case with emerging markets, Ukraine poses its own unique yet familiar blend of challenges. Economic weakness, IP issues, bureaucracy and corruption can be a challenge, although integration with EU regulations as part of the free trade agreement has shown improvements. The front page issues of political and military conflict with Russia to the east of Ukraine tends to be overstated and has little actual impact on the day to day dealings. Overall, we have seen that most issues that arise are related to the usual challenges associated with entering the new markets. 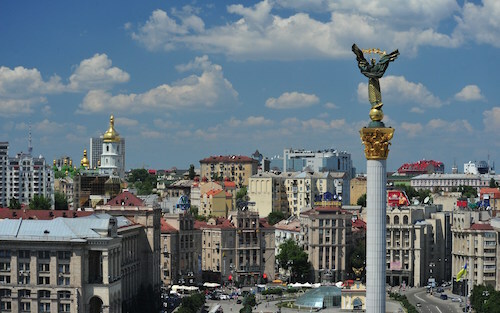 Ukraine has much to offer to British firms both as an export market and as a potential source of high quality, competitively priced products and services. If you are considering Ukraine as your next export or sourcing destination (and you should be!) please feel free to contact Vimes Consulting and we will be glad to assist in opening up this new and exciting market to you. Previous Post How do I evaluate my export readiness? Next Post What is an export?